Entries categorized "Coca Cola Campaign"
Given that there are only 24 hours in a day, I have had to stop blogging here. I am now spending all my spare time on the ColaLife Campaign and I am now blogging over on the ColaLife blog. See you there! I have just learned that this blog has been listed by Business Week who want to identify 'the voice of innovation'. This is a great honour especially since most of my online activity hasn't taken place here. So I thought I'd sum-up 2008 here to provide a link through to where the action really is! This post was a real-time experiment in social networking set-up to demonstrate how social networking works for the benefit of the sceptics. It worked better than I could have wished. This post was the start of the ColaLife campaign. This took a 20-year-old idea which had never achieved traction and applied the power of social networks to turn the head, engage and influence the behaviour of a global brand. The story got too big for this blog and now has its own blog here: colalife.org/blog. We can distribute Coca-Cola to all corners of the World and yet 1 in 5 children die before the age of 5 in developing countries, that's 4 a minute in Africa alone, 5,500 a day. They die from very simple causes like dehydration from diarrhoea. 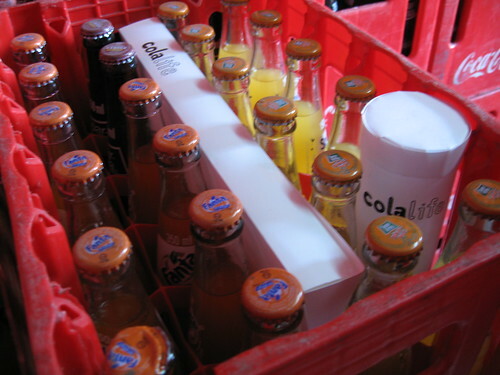 ColaLife wants to get Oral Rehydration Salts, and other social products, out to all the places you can buy a coke by putting them in Coke crates. 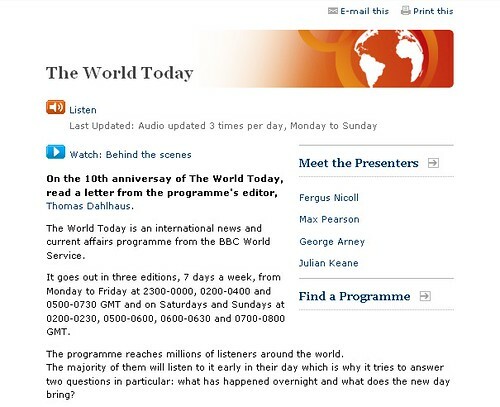 The progress made to the end 0f 2008 was nicely summarised in a BBC Interview broadcast on 27/12/08. The motivation for this post came from a social event where I introduced my father to someone with power over me. This someone responded by saying I was mad in my belief in open innovation. Embarrassing but also inspiring! This post appeared on the ColaLife blog for the benefit of all those who couldn't make the first ColaLife face-to-face meeting in London, UK. It was posted on the same night as the event itself. I gave my son a flip video and asked him to go around and ask people why they were there. This post includes nine mini videos hosted on YouTube . . . . click all the play buttons at once to get an idea of the atmosphere! Using open innovation principles we set about re-designing ruralnet|uk's online community, in the open and online. On 22/1/08 a new Drupal site was launched where the co-design process took place: ruralnetonline.org.uk. The culmination of the process was summed up here: Pulling insights together. Before Web 2.0, online portals and 'one-stop-shops' seemed like a good idea. Now they look like you've got all your eggs in one basket. Now you can (and should) have your content everywhere eg your images on Flickr, your video on YouTube and Vimeo as so on. Then your website becomes an aggregator of all your stuff not the only place people can find you. So your website becomes the end point, not the starting point, of your web presence. This means that many more people will find you through the different content channels you are using and it also means you can re-use and re-mix your content in different places for different audiences. A hat tip goes to my friend Julian of Georgia Wonder for opening my eyes to this. This is not mine, it belongs to Stephen Dale but I reported it on the blog I kept while on secondment the British Government's Department of Communities and local Government. This post built on an earlier one which suggested that the Government's 'one stop shop' approach to online service delivery (aka Directgov) should be turned on its head - Directgov or Govdirect? Spot the difference (28/5/08). I would like to see the BBC develop a similar strategy to reach the small percentage of people in the UK that never use BBC services. An interesting year. Thanks to everyone who has supported me over the years and been happy for me to build on their ideas. Sorry, I know the Coca-Cola campaign (ColaLife) has supposed to have moved on but I just have to show you this. If you have a YouTube account, when the video ends please go to YouTube and 'favourite it' and give in 5 stars. And, if you have time please leave a comment too. Thanks. Oh, and if you haven't already joined the ColaLife Facebook Group please do so (and invite your friends). we must keep the pressure on! The Coca-Cola Campaign has out-grown this personal blog (I am very pleased to say) and thanks to the work of a member of the Coca-Cola Facebook Group, Dave Briggs, we now have a dedicated website (colalife.org) and blog. All the past postings from this blog have been placed there and that's where all future updates will be posted. Please join in - there are now lots of options. Here it is, the 30 sec video to support the ColaLife submission to Goggle's Project 10^100 (10 to the 100th). Please go and look at it on YouTube. It's a thing of beauty! Please can I also ask you to comment on it on YouTube and rate it (highly?). It's worth clicking the 'watch in high quality' link to appreciate the detail. After watching, commenting and rating - that should only take 2 minutes - can I ask you to do one more thing? Please send a link to this page to 10 of your friends and ask them to do the same? Very many thanks. I want to thank the following people who have dedicated a significant part of their lives over the last 3 days to pull this together: Luke Berry (artist); Sam Berry (Animator); Julian Moore (Sound); Simon Cohen and Howard Lake for creative suggestions. There's still time to comment on the text of the application if you can. Onwards and upwards! 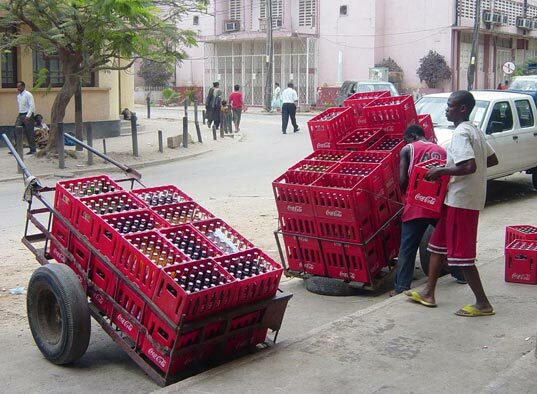 Here's the latest from Adrian who is carrying out research into Coca-Cola's distribution networks in Ethiopia and Tanzania. Previous stories are here. OK, I confess, after just a week or so in 'Dar', I'm looking forward to being taken out on a visit to the 'Viagra Inn'. Now, don't go jumping to conclusions. The Viagra Inn is actually a small retail outlet serviced by one of our Coca-Cola distributors, and I'm not expecting see any little blue pills on the shelves. And yes, of course, I asked about the name. It's part of my job to identify great examples of local enterprise and get a feel for what works. I think what I'm seeing here is a very canny understanding of the marketing 'hook', and yet another example of the great sense of humour and creativity you see in Tanzania. Many of our distributors are real wits, they're full of ideas and find lots to laugh about, despite the apparent difficulty of their lives. People here are consistently friendly and welcoming where-ever we go. So, of course, I'm keen to analyse this powerful marketing message they've chosen, to raise their sales, fix their modest business in everyone's mind (well, it certainly worked for me!) But, no, I'm told (was that a little coyly? ): it's actually the combination of the two owner's names. I'm not sure if I'm being taken for another ride here, but it certainly attracts attention and for me is yet another reminder that not everything I see is exactly what it seems at first! I've just found this fantastic set of photos by tielmann on Flickr with images of Coca-Cola's 'Manual Distribution' from around the world. Meanwhile, here's the latest note from Adrian Bristow, who's now working with Coca-Cola in Tanzania, where he's collecting local opinions and ideas. On the way, he's been in the USA, talking to experienced development agencies to learn about what they're doing. The local research in Africa will lay the groundwork to take forward some ideas on using Coca-Cola's local distribution networks. Our group's proposal to distribute rehydration salts and related educational materials will be part of the mix that local Coca-Cola distributors will look at. "It's been pretty hectic since I left Ethiopia: I have had some interesting travels and met a lot of really helpful people. In particular, I spent some time in New York speaking to people in the development community, where I found an incredible passion for work in Africa. There are a lot of really good initiatives on the go, although the one thing that struck me was how we could potentially be working more closely together for an even bigger impact. "On the way back out into the field I grabbed a bit of time at home in South Africa. Then this week it's off to Tanzania. Here I'll complete the initial data gathering from more local Coca-cola distributors - the Manual Distribution Centre owners. We are really trying to get a good understanding of their key needs as well as their views on how they could be part of the solution as a partner of Coca-Cola to address what they view as key community needs. "I'm looking forward to Dar-es-Salaam: a great place to visit, a hive of activity and being on the coast adds a special relaxed feel to the place. That's where I'll be when I send you the next update and hopefully - if I can just make some time to sit down at the computer - a bit more detail and some pictures!" 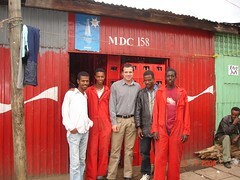 This message comes to us from Adrian in Addis Ababa, where he recently spent a day meeting some of the independent local distributors working on the Manual Distribution Centre (MDC) model that Coca-Cola has promoted. Although their main focus for analysis is Tanzania, they were guided to gather some comparative data from Ethiopia where the distribution model seems to be working best. Hence Adrian's trip. "Mubarek is an MDC owner and his team in Addis Ababa were all previously unemployed. I met them at their distribution centre and heard all about their successes, the issues they face and their opinion on how we could improve their lives and the lives of the communities they serve. It may come as some surprise that Ethiopia is where this distribution model was conceptualised: really exciting, as it breaks some stereotypes about where models usually get developed. Ethiopia is one of the toughest markets to operate in, but our Ethiopian Coke Bottler colleagues have shown that it's possible to rise above the challenges! "You get to meet so many interesting people when you are out in these countries. The harsh realities of what faces people living in areas decimated by poverty hits you hard. However, I also get so inspired by the resilience of the people and the lengths that they will go to to try and better their lives and the lives of their families. I am also really motivated by the positive intent of most employees at corporates to play a constructive role. They often just don't have the necessary channel to do this and their lives are so busy that they don't have the time to create this themselves. That's why projects like this are really important. "We know that this system is creating many new entrepreneurs and many new jobs, but we also feel that there is a lot of untapped potential in this means of distribution. One of the aspects which I know has created the interest in Simon's Facebook group is around how the distribution system could be used for 'greater good'. I am discovering that it's a bit more complicated than I initially anticipated as we are dealing with independently-owned businesses. Local needs and conditions vary quite a lot. However, the 'in-principle' commitment and level of support is fantastic both from the Coca-Cola bottler side and the entrepreneurs. It will take a bit of time to find a workable model but we are exploring far and wide, and I'll bring you more news as possibilities unfold." On Sunday (13/7/08) at 5am (BST) I'll be on my bike on my way to BBC Bush House for the Weekend edition of The World Today on the BBC World Service. I'll be discussing the Coca-Cola Campaign with a panel of people which includes a Professor of Econmic Development from Kenya who will be in the Nairobi studio. You should be able to hear the programme live here at 5am GMT (6am BST). I'll try and get a recording.